It's about time your guests were really heard. The silent majority finally have a voice, one that we’ve made it super easy for you to listen too. "It's like Google Analytics but for your restaurant"
Exponential growth in data for your restaurant, elegantly handled. What growing data can do for your restaurant. Make more decisions, make those decision faster and delight your guests further. All while avoiding paralysis via analysis. See problems before they become big problems, nip things in the bud. This is especially helpful on staff data points. Data is great, but not if you don’t understand what to do with it. W make sure the information we collect is actionable 100% of the time. Would you recommend the restaurant to a friend? Get better scores. Net Promoter or Net Promoter Score is a management tool that can be used to gauge the loyalty of a firm’s customer relationships. We calculate your NPS using the answer to a key question, using a 0-10 scale: How likely is it that you would recommend your restaurant to a friend or colleague? Unhappy customers who can damage your brand and impede growth through negative word-of-mouth. TableYETi allows you to listen to the silent majority in away never before possible. NPS on its own is relatively useless, you need to link NPS to dishes and servers. You want to know that everyone served by Jane left a 9 score but everyone served by Bob left a 3. Bob probably needs some training. 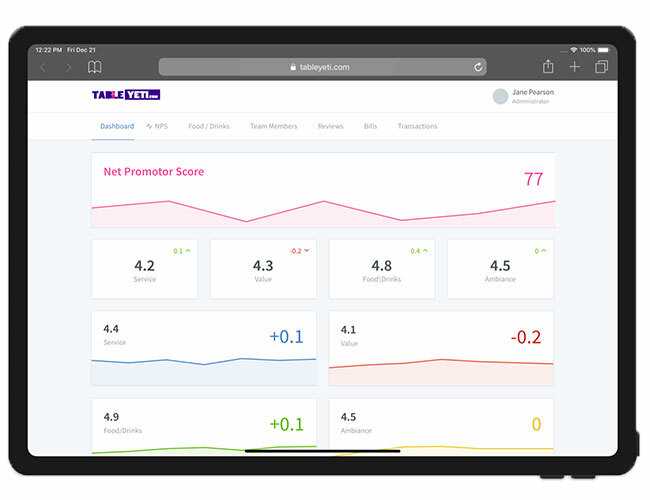 TableYETi automates the collection of your NPS and presents the results in a beautiful, actionable way. We've proven that our restaurant intelligence increases revenue. Use the TableYETi restaurant intelligence platform to measure key data points across your business. Especially the Net Promoter Score. TableYETi dissects the data and presents it, so can see essential trends. Do more of what drives positive trends and fix what’s driving the negative patterns. We can guarantee that if you focus on improving negative trends, and increasing NPS, your restaurants’ revenue will grow significantly. Now you can see whether the steak performs better from the local butcher or Hereford farm. Find out what your guests thought of the 2006 Laurent Perrier vs that tasty 2008 grape. You can track how your team members perform over time. You want this up and to the right. 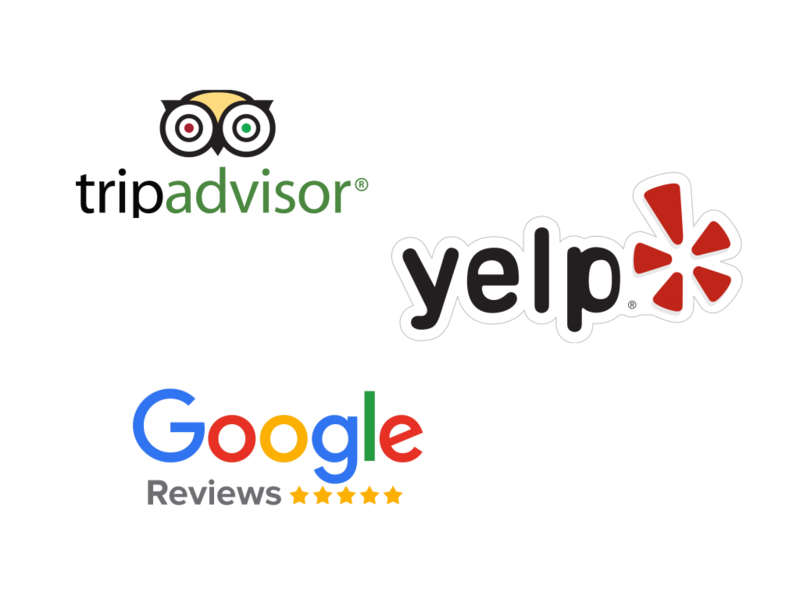 Most restaurants collect a few reviews per week. Imagine what will happen when you 100x that data. 95% of your unhappy customers will leave without saying a word. Now they have a voice, helping you improve. Guests pay without staff members help, meaning the reviews are anonymous and kept that way. The silent majority is a large group of people in a country or group who do not express their opinions publicly. is how many people are happy to leave feedback when asked. is the certainty your business will grow if you listen to the silent majority. Know where you need to focus your training efforts, based on the data you receive from guests. Measure it and it will grow. Generating ratings for each staff members will gently push them to improve. In business, you have to make hard decisions. These decisions can be made a little easier when data-driven. Restaurant intelligence is what happens when you replace the paper bill with something ‘more intelligent’.